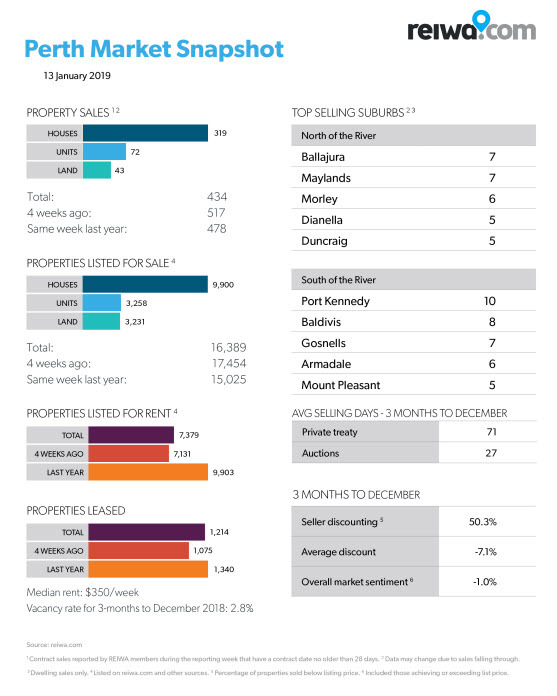 Sales activity increased 54 per cent in Perth this week, with 434 reported transactions, as activity returned to more normal levels following the traditional lull of the festive season. This increase can be attributed to a 56 per cent rise in house sales, an 80 per cent increase in unit sales and a 19 per cent increase in land sales over the week. There were 16,389 properties for sale in Perth at the end of this week, which is two per cent more than last week. A closer look at listing stock levels shows house listings increased by two per cent, listings for units increased by two per cent and listings for vacant land increased by one per cent. This week’s total figure is six per cent lower than levels seen four weeks ago, but are nine per cent higher than levels seen a year ago. REIWA members reported there were 7,379 properties for rent in Perth at the end of this week, which is one per cent more than last week. This week’s rental listings figure is three per cent higher than four weeks ago and 25 per cent lower than the same time last year. What are the minimum security requirements for your rental?